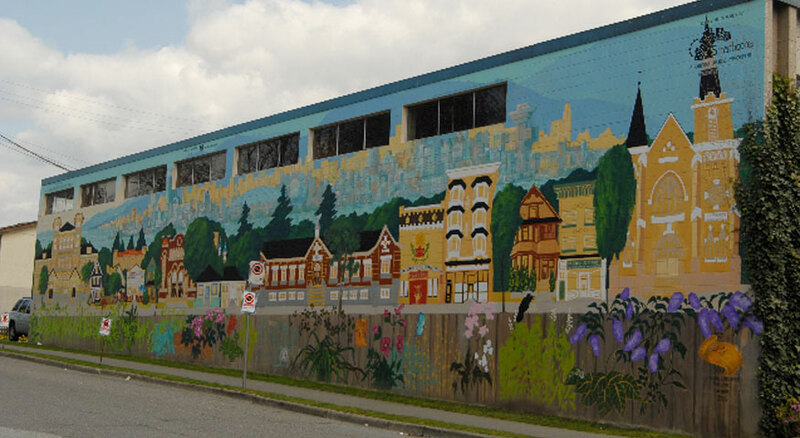 The McGregor Mural highlights some of the schools, churches, community centres, stores, residences, flora and fauna of Strathcona against a background of the city that not only has stemmed from it, but which now threatens to encroach upon it. Acrylic on concrete block. Six persons were employed through Sandy MacKiegan and CETA. Paint and elevation assistance were provided by the Vancouver Graffiti Management Program. Sponsorship was by the Strathcona Business Improvement Association.